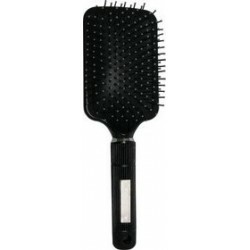 A paddle brush is used to straighten hair, flatten long hair, and tame fly-aways. A very good hairbrush for detangling and can also be used to remove loose hairs, and increase circulation to the scalp. Excellent Salon Quality Paddle Brush designed to use with all our online Extensions and Ponytails.